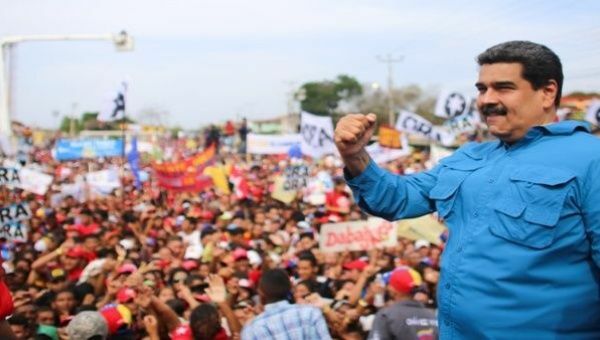 Venezuela’s President Nicolas Maduro and presidential candidate for the Broad Front of the Homeland, Maduro addressed a rally in the state of Falcon on Friday. April 27 (teleSUR) Venezuela‘s President Nicolas Maduro has reiterated his call for voters to cast their ballots in the May 20 elections to appoint a new head of state, along with newlegislative and municipal councils. Presidential candidate for the Broad Front of the Homeland, Maduro addressed a rally in the state of Falcon on Friday: “The political power of the country belongs to the people of Venezuela; that is why we are in a revolution,” he said. “I ask you to elect me as the new president of Venezuela with ten million votes for the peace of Venezuela,” Maduro continued. At an earlier rally in the state of Merida, Maduro told the crowds: “We have to prepare for May 20, to get ten million votes for the people: if we want peace, we will vote. Maduro also announced the government will deliver US$500 million in Petros – Venezuela’s cryptocurrency – to Falcon State Governor Víctor Clark, to strengthen the economic zone of Paraguana and construct 100,000 new homes.